Glassphemy! A Way to Recycle Glass Bottles with Fury! Glassphemy: A Way to Recycle Glass Bottles with Fury! Pissed off about oil spills? Angered by over-packaging? Rather than letting all that pent up frustration to get the better of you, why not grab a used glass bottle instead and commit GLASSPHEMY!? From the same folks who brought you last year’s famed Brooklyn dumpster pools, now come the reverberations of recycling furiously with an eco-conscious heart! Standing wide and high at 20 x 30-feet, GLASSPHEMY! is visceral and psychological recycling center designed specifically to allow you to hurl glass bottles at your friends, enemies, and loved ones, all while they are safely tucked away behind steel and bulletproof glass. Monster-truck antics aside, GLASSPHEMY! is actually a fun approach to recycling. 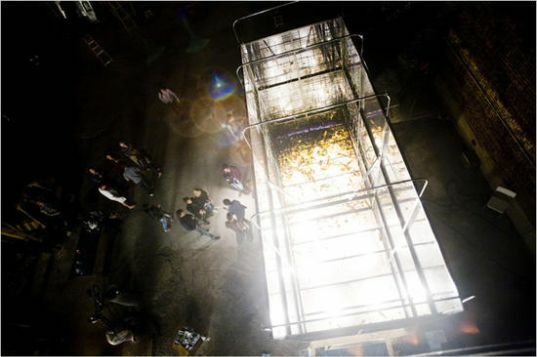 Using bottles donated from local bars, visitors are brought to a tank of destruction where they can lob bottles at bulletproof glass. And with every kerfuffle of a broken bottle, a bevy of vibration-sensitive lights flashes and flickers are set off in sync. 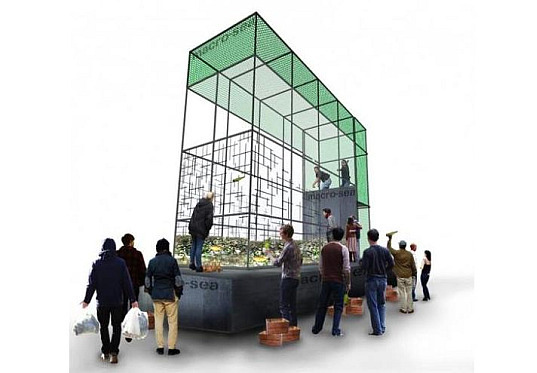 An installation created to respond to the accumulation of excess broken glass in industrial lots, the creators will take all the residual broken glass to create a new design submitted by the readers of ReadyMade. GLASSPHEMY! is currently in a “semi-secret” location in Brooklyn, New York, so if you’re a smashing hopeful who wants to get in on the fun, just send your recycling ideas to Macro-Sea and you may be granted access. Another way to recycle beer bottles: About 10-20 years ago a company or non-profit group designed a bottle that could be re-used as glass building blocks to create walls for houses in Africa. The bottles had either a triangular or rectangular shape (I forget exactly which). A large number were manufactured, but for some reason, the concept did not catch on or prove feasible. Does anyone know the name of that group? Any articles on the experiment? Has anything similar been tried, with glass or plastic? Pissed off about oil spills? Angered by over-packaging? Rather than letting all that pent up frustration to get the better of you, why not grab a used glass bottle instead and commit GLASSPHEMY!? From the same folks who brought you last year's famed Brooklyn dumpster pools, now come the reverberations of recycling furiously with an eco-conscious heart! Standing wide and high at 20 x 30-feet, GLASSPHEMY! is visceral and psychological recycling center designed specifically to allow you to hurl glass bottles at your friends, enemies, and loved ones, all while they are safely tucked away behind steel and bulletproof glass.